NORTH Tamil Nadu abounds in Narasimha temples. And the most important among them is the one in Sholingur, whose original name was Gadikachalam or Chozhasimhapuram. 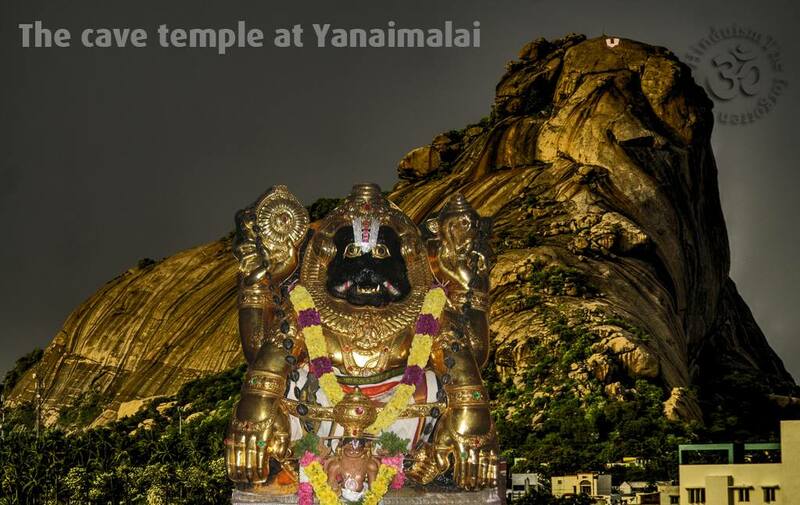 There are not many temples in South Tamil Nadu, exclusively dedicated to Lord Narasimha though He is worshipped in sub-shrines in some temples. However, there is one dedicated to Him — the cave temple at Yanaimalai, eight kilometres from Madurai, on the road to Melur. This place, though not a `Divyadesam' sanctified by Azhwars' hymns, is situated between two holy places — Azhagarkoil in the north and Thirumohur in the east. There is a hill in the shape of an elephant adjoining it, hence the name Yanaimalai. The Yoga Narasimha Perumal temple is situated to its west in a village called Narasingam. It was built by Maran Kari, a minister of the Pandya king Jatila Varman, also known as Komaran Sadaiyan. According to the Sthala Puranam of Madurai Koodal Azhagar Temple, known as Koodal Manmiyam, published 80 years ago, sage Romasa had installed the Narasimha idol in a cave in the hill. And the 87th chapter of the Uthara Kandam of the Brahmanda Puranam says the sage did penance on the banks of the tank called Padma Thadagam, as it was filled with lotus flowers, near the Gajagiri Kshethram (the present Yanaimalai) seeking progeny, and wanted the Lord to appear in His Narasimhavatara. The Lord appeared as Ugra Narasimha and the heat that emanated from Him was unbearable. Even the celestials were affected by it and they all came to Gajagiri Kshethram and prayed to the Lord to calm down. The Lord could not be pacified and then they sought the help of Prahlada, whose arrival quietened Him to some extent. They prayed to Goddess Mahalakshmi, who also took Her abode in Him as Narasingavalli, after which He became Yoga Narasimha. The Lord later granted the boon sought by the sage. According to another legend, Lord Siva was afflicted by Brahmahathi Dosha after He plucked one of the five heads of Lord Brahma. He was relieved of it after He took bath in the holy water source here, also known as Chakra Theertham, and He worshipped Lord Narasimha. It is believed that taking a dip in the Chakra Theertham, which is near the temple, rids one of all sins. The Thiruvilaiyadal Puranam, written first by Perumbatrapuliyur Nambi and later by Paranjothi Munivar, says that the Chozha king, who could not win the battle against the Pandya ruler, sought the help of Jains. They created a giant elephant using their mystic powers and directed it to kill the Pandya king and destroy his capital. But the Pandya prayed to Lord Siva to save him and his capital. The Lord sent to him the `Narasinga Asthram,' which turned the elephant into a hill. To commemorate this event, a stone elephant was installed in Madurai near the Vaigai facing the north, which is found near the Yanaikkal bridge even today. Inscriptions in the cave temple say that Maran Kari, the minister of the Pandya king, started the construction of the temple in 770 A.D., which remained unfinished, either due to his death or due to some other calamity, and was completed by his brother Maran Eyinan later. He also built the Muka Mandapam and consecrated the temple. The fort around Azhagarkoil is also known as Iranyan Kottai, and even now a stone idol of Lord Yoga Narasimha is found atop its entrance. A big idol of Yoga Narasimha, found in the outer Prakaram of the Azhagarkoil temple, known as `Jwala Narasimhar,' is said to be ferocious. To pacify Him, regular Thirumanjanam is performed with gingelly oil. A hole is found in the ceiling above the idol which is believed to let out the fire emanating from it. The foot of the hill, where the Narasimha temple is located is known as Narasingam or Hasthigiri or Gajagiri. The inscriptions at the temple are in ancient Tamil, Brahmi and Vattezhuthu. There are two inscriptions of Srivallabha Pandya, which speak about the gifts made to the temple. There are also inscriptions of later Pandyas and one of them, belonging to the rule of Sundara Pandya, (1216 A.D.) gives details about his conquest of the Chozha country. Another inscription says that land gifts were made at Iyakkimangalam village for conducting the festival in the Yanaimalai Temple. Inscriptions belonging to the rule of later Pandyas, especially Maravarman Sundara Pandya I, are also available but most of them are incomplete. The Yoga Narasimha idol at the temple is six feet high, sculpted on the hill itself. There are Mahamandapam, Garuda Mandapam and Mukhamandapam of the Pandya period. The shrine of Goddess Narasingavalli faces south, at the entrance. Inscriptions say that there was also an `agraharam' for Vedic Brahmins, but there is no trace of it now. The temple bustles with activity during the Narasimha Jayanthi, and on Masi Makam day, when Sri Kalamega Perumal of Thirumohur visits this place for the `Gajendra Moksham' festival. The temple is unique for its utsava idol of Narasimha in a standing posture with the Sudarsana and Panchajanya in His upper two hands while the left lower hand holds the Gathai and the right is in the Abhaya Hastha posture. A similar Narasimha idol is worshipped atParikkal. Efforts are on to renovate the temple. The Balalayam was set up on April 7 and the Lakshmi Narasimha Apthan Kainkarya Sabha has decided to undertake the work. It has proposed to make gold-plated copper coverings for all the idols, make Thiruvachis for the Moolavar and Utsavar idols, provide them with new Peedams, construct a three-tier Rajagopuram, cover the ceiling with tiles, provide marble floorings inside the sanctum sanctorum, raise the compound walls, cover the outer Prakaram with granite slabs, repair the Vimanams, Garuda Mandapam, Thayar Sannithi, and also build a new Mandapam in front of the Thayar Sannithi. Contributions for the renovation may be sent to the secretary/treasurer, Sri Lakshmi Narasimha Apthan Kainkarya Sabha, 1/8, Mela Mada Veedhi, Thirumohur-625107, Madurai district.